Meet your new furry friend at our next event! Here's our season schedule. Recognizing that a great many potential pet owners shy away from traditional animal shelters believing them to be too noisy and depressing, PACC911 conducts eight outdoor adoption events throughout the Valley each year. 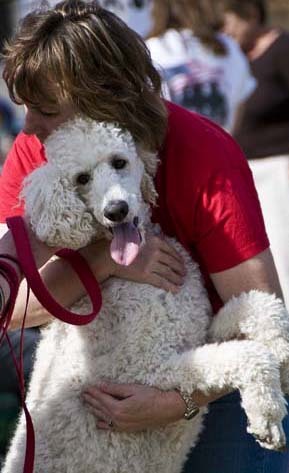 Depending on the location and size of the venue, the public enjoys the unique opportunity to select from hundreds of healthy and adoptable dogs, cats and critters from many rescue group partners at one time, all in a fun and stress-free setting. All pets in attendance are spayed, neutered and vaccinated. Our rescue partners know their pets’ personalities and act as a matchmaker to help you make the best choice for your circumstances. Our current adoptathon season is over until the fall, when we’ll start up again after the hot summer months. We have to wait until it cools down for the safety of the animals. If you are up north near Heber, we’ll have one adoptathon there in early July; the details will be posted closer to that time. Our complete adoptathon calendar for fall 2019-spring 2020 will be put up sometime in late August. Be sure to look for it! Can’t wait till our next event to find your new pet? You have two options for adoption at your fingertips. Go to our coalition partners page, where you’ll find over 100 local rescue organizations with links taking you directly to their websites. You can see photos of their adoptable dogs and cats all waiting to go home with you right now! Go to our Facebook page. It features many animals in urgent need of adoption or foster and has all our latest up-to-date news.